The Purrfect Angle's Unique Design Provides Variety & Satisfaction. Allows your cat to scratch horizontally, at an upright angle, or at a downward angle - A definite kitty yoga prop. Cats love to stretch and scratch in different positions. Original & Sophisticat Sisal options now available! Dense, corrugated insert provides an alternative scratching material - Your cat will appreciate the variety and quality of this oh-so-enjoyable surface to scratch and shred. Sturdy - Unlike flimsy cardboard scratchers that slip, are too small, or flip over, this well-built scratcher supports kitties of all sizes. The need for a good, hearty scratch can be fulfilled to your cat's maximum satisfaction. Flat or angled - Removable rear leg allows Purrfect Angle to lie flat. Great alternative for cats that scratch carpet. Tip: If your cat is an under-the-bed scratcher, buy an extra insert, and stick it under there for your kitty to discover. 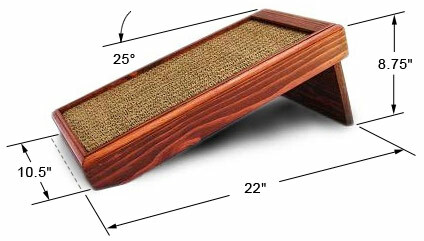 Compact - Can be placed in smaller or shorter areas where a scratching post won't fit. Sleek, attractive design - Solid wood frame in your choice of light or dark stain is an elegant addition to your home. Free Catnip - Premium, 100% organic catnip included with every order. You requested, we provided - Inserts are now available in sisal material. That's right, the same tough, cat-satisfying sisal material that covers our other Purrfect Post products is now available as an option for your Purrfect Angle insert. Available in original and Sophisticat colors. Consider keeping both sisal and corrugated cardboard inserts on hand for maximum scratching variety. Money Back Guarantee - Love it, or return it. For more information about this ingenious scratcher, click here. Check out our Testimonials and Gallery pages filled with satisfied customers. We have more videos! Click the "Product Videos" tab below to see more videos featuring the Purrfect Angle! With the Purrfect View and Purrfect Angle combination, the variety of scratching surfaces will spice up the life of your kitties Whether snuggling up in the bed or platform, or using the inclined, vertical or horizontal scratching surfaces, your cats will surely be satisfied. Check out the View and Angle combo at purrfectpost.com. Max & Jojo use them frequently as well as the two posts we have. Well made and more attractive than the inexpensive cardboard ones. Purrfect angle - rise above!!! Beautifully made and excellent quality and Smudge is delighted she can do a long stretch while scratching! Vertical or horizontal she is doing her thing! My Cat loves to shred his claws both vertically and horizontally. The angle is perfect because he loves to scratch in both directions on the angle. I also love this product because you can get both corrugated cardboard inserts and sisal inserts. My cat loves variety in his scratching surfaces, so this works great. The cats liked this right away. The sisal insert seems sturdy and will probably last awhile. However, the wood is really cheap. The dark stain is thin - surface only on cheap pine wood. They have already scratched it off in several places. For the price, disappointing. Some cats will scratch through the wood, which is solid wood and has two coats of stain applied. The wood is high-quality pondersosa pine. If your cats tend to scratch the outside of the post, you may with to choose the light wood stain.